Following the falsified elections that took place on February 18th, the citizens of Armenia have taken to the streets, demanding that their voices and their votes be upheld, in the name of democracy and social justice. The Armenian Youth Federation, Western USA firmly supports the will of the people of Armenia, and vows to do everything in its power to uphold the integrity of citizen rights. As Diasporan youth who regard Armenia as both their ancient homeland and our future home, we will remain vigilant in our struggle to ensure a healthy and democratic Republic of Armenia, in which the government reflects the will of the people. As such, it is our right and our responsibility to call on the government to uphold its obligation to its people, in Armenia and throughout the Diaspora. We believe that every Armenian citizen has the right to exercise their free will through a democratic voting process, and to hold the government accountable for respecting and upholding this constitutional right. We believe that a fair and just process will steer our nation on a path toward democratic and social development, and will help create a bright and prosperous future for our people. SAN FRANCISCO, CA- Many Armenian youth living in the diaspora struggle to stay current with the daily issues occurring in Armenia. On February 11th, the Armenian Youth Federations San Francisco “Rosdom” Chapter, held a Youth Corps Fundraiser at Saint Gregory Armenian Apostolic Church. AYF Youth Corps is a six week summer program, which allows diasporan Armenians to establish a lifelong bond with their motherland and to help strengthen their homeland. The program consists of five weeks of volunteering at the day camps and a week of touring. There are also several excursions and activities that take place during the entire program. The main goal of Youth Corps is to allow Armenians of the Diaspora to have a direct impact on the lives of impoverished kids and their families. The program dates back to 1994. By the time the cease-fire took place between Armenia and Azerbaijan, many villages were left war torn. The AYF, which was established in 1933, sent many Youth Corps volunteers to Artsakh to help rebuild these villages. Since 2007, the program has shifted its focus from rebuilding war-torn villages to running summer day-camps for the children of Armenia and Artsakh. As the event came to a close, donations to the Youth Corps program amounted to over $1000. The program ended with many locals asking Hoory additional questions about the program and her experience. This years Youth Corps Committee is expecting to receive even more applicants, in order to send more youth to Armenia in order to change the lives of countless Armenian children. 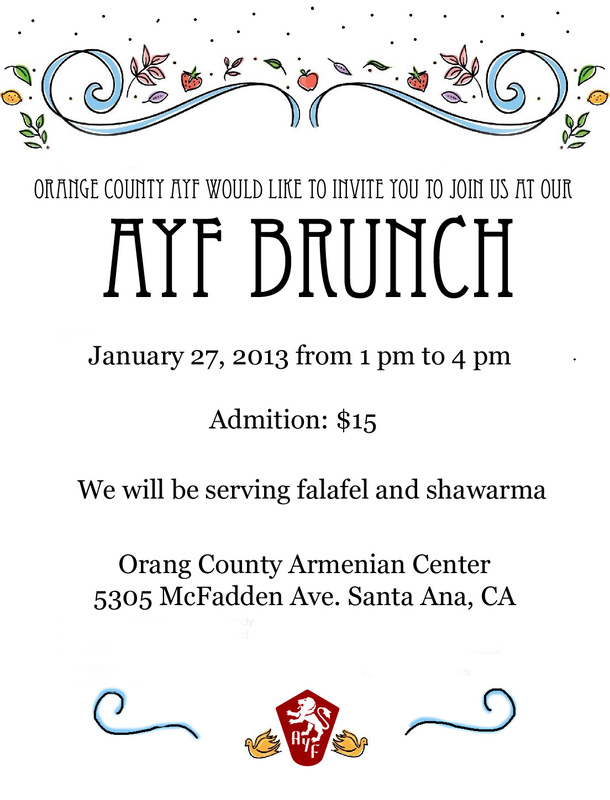 On January 27, 2013 the Orange County AYF “Ashod Yergat” chapter hosted a community brunch serving our homemade Shawarma and Falafel. 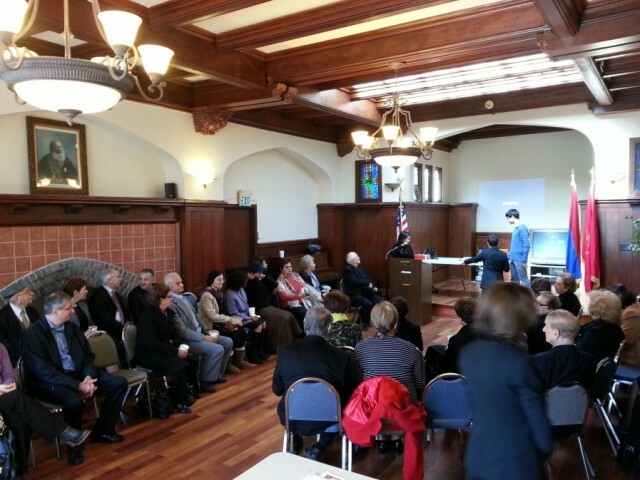 Members gathered early at the Armenian Center on the day before preparing the food that was to be served the following day. Sunday morning everyone began cooking, preparing all the food and setting up the tables for our guests. Everyone was very excited for our first brunch this year and to see everyone’s faces as our guests began to line up was priceless. The brunch started at 1pm and ended at 4pm. After serving Foul and Mamounya at our annual brunch, this year the organizing committee had wanted to try something new with our community. Thankfully, the Shawarma was a hit. As soon as Sunday Service at Church had ended, the line began to form. Slowly but surely almost all the tabled filling up giving OC yet another successful brunch. Everyone enjoyed the food and also took some seconds home. The event turned out to be successful and the chapter couldn’t be happier. Fundraisers are very important not only to our chapter but our community as well. It give the community an opportunity to get together, support our youth organizations and to see for themselves everything that our youth has been working on. Being one of the smaller Armenian communities, Orange County families are great when it comes to supporting our youth. We appreciate our community supporting us and always being by our side as we move from one event, from one challenge to the next. The strong bond we have with our community helps us all with future plans. Most of us will not give the ultimate sacrifice for our country. The reasons we give to not join the armed forces will vary in validity, but a time will always come when some of us are forced into physical conflict for the sake of others. During those sad and unfortunate times when might makes right, pens become less valuable and history is written in blood. Yet, the times after war and tragedy are precisely when great philosophies are forged, during the aftermath and digestion of what has occurred. The time that followed the culmination of WWII saw a revival and evolution of many philosophies: Jean Paul Sartre brought the rebirth of existentialism; J. Robert Oppenheimer saw himself “become death” after his work on the Manhattan Project; the Geneva Conventions sought to have humane wars in the future (if such things exist); and, of course, the Cold War was born. Today, Armenia seems to beg for a renaissance and a revolution. The country has been independent for over twenty years and, aside from the Artsakh War, the greatest threats to our nation have come from within. The Armenian people have slowly allowed an oligarchy to take control — an oligarchy that no longer feels the need to even mask itself as a democracy. An authoritative government that preaches democracy yet does whatever it wants is a government that fears the power of the people. Armenian politicians no longer have that fear because even the greatest philosopher cannot overcome tank shells and bullets. 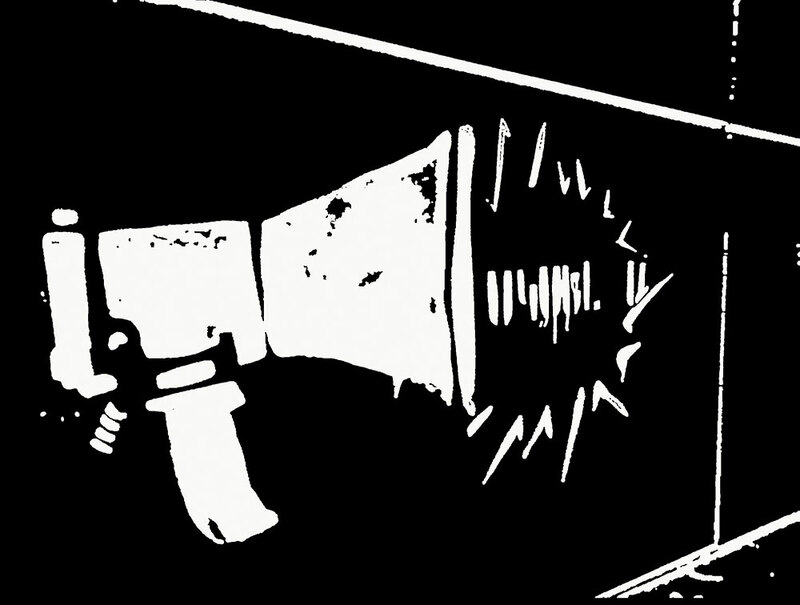 The people’s responsibility is to stay involved in government and create an atmosphere that welcomes critical discourse, debate and conflict. Kings are mortal, but ideas are not. The enthusiasm and nationalism that we have seen in America through Armenian Students’ Associations, the Armenian National Committee of America, the Armenian Youth Federation and other organizations is very motivating — yet most of the American-Armenian population is out of the loop and apathetic to the current and future welfare of Armenia. The community leaders in America and in Armenia must nurture an active populace and a rich marketplace of ideas. We must elect officials unafraid of being wrong — officials who are not conservative or reluctant to change because of their ego and image to uphold. In our search for the truth, we must not forget that we can only seek it and never posses it. We must humbly defend our opinions with the knowledge that we may be wrong. Above all, we must respect others who seek to find the truth, and distrust all who claim to have found it. We as a people are not unique in our challenges. Countless other societies have been conquered, enslaved and discriminated against. We are not unique, but that does not diminish the amount of blood and suffering our ancestors have endured for us to still be here. The thought of losing all feeling provokes a great deal of emotion, because to lose life is to pay the highest price. And to learn nothing from those who gave all to death and abandon our memories of them is to commit treason against humanity. On the cosmic scale, all human drama, tragedy and conflict seems petty and anthropocentric. In 1969, we went to the moon and discovered the Earth, yet on our pale blue dot we continued to kill for our imperfect thoughts and opinions on life. We must not forget that we are humans first and Armenians second, although humans have not yet collectively evolved to care about one another globally. Our genes are most common within family first, culture second and finally in people from other ethnicities. Charity starts at home, and so our most precious and grueling fights must come from within. The ways in which you choose to serve our culture are many, but to do so is imperative. A stagnant culture is built from stagnant individuals who resist change because of fear, bigotry and ignorance. Paruyr Sevak, speaking of Armenia, once said “I have not participated in any fights, but I have never in my life taken half a step that hasn’t brought me to you, I start and end with you, like a circle.” The resources are in front of us and the demand for bright ideas is strong; all that needs to be done is to start walking towards the truth – while never forgetting road we traveled. In all societies, the discrimination women experience during and after armed conflict stems from a traditional understanding of gender roles. The Armenian society, deeply entrenched in patriarchy, is no different. The perception of women as nurses, wives and mothers is the norm, whereas men are cast as aggressors and soldiers. 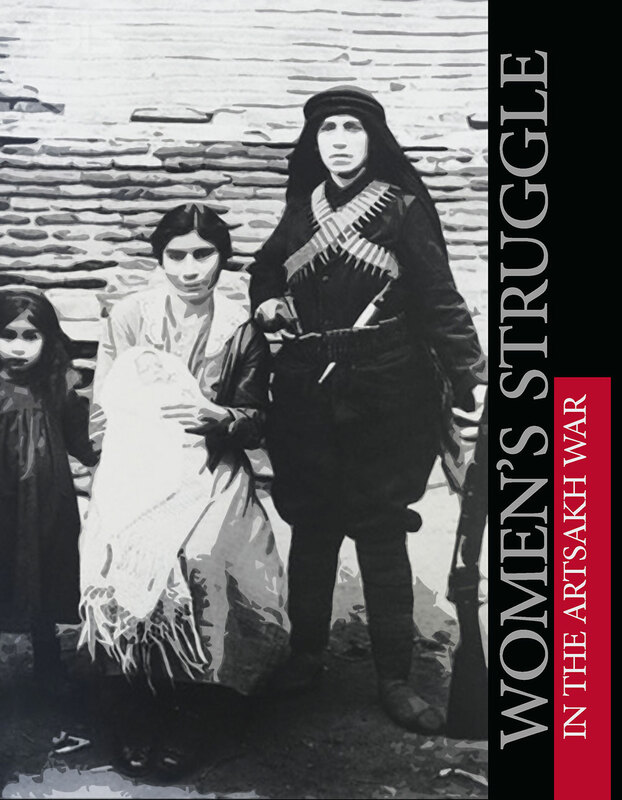 Although women in the struggle for Artsakh’s liberation originally entered the war effort as nurses, it wasn’t long before many of them grew impatient of their limited roles and began to take up arms. “I swore on the grave of my first commander and a good friend of mine from childhood that Karabakh [Artsakh] will be freed. Our people must live in peace. Back then, Gayane Arakelyan and I spoke to Arkady Ter-Tadevosyan asking his permission to create a female unit. After receiving approval, we posted the announcement. A few days later, we already had twenty-eight volunteers. Eighteen of them were sent to a training center, and eight girls were ready to go into battle. During this time, women fell victim to corruption and bribery, solely based on their gender. Anoush Ter-Taulian, a diasporan Armenian living in Artsakh since 1994, recounted the stories of young women who gained or retained posts in return for giving in to the sexual advances of army leaders and generals. Others, on the other hand, were forcibly summoned to a newly-built mansion to face severe punishments for refusing these advances. 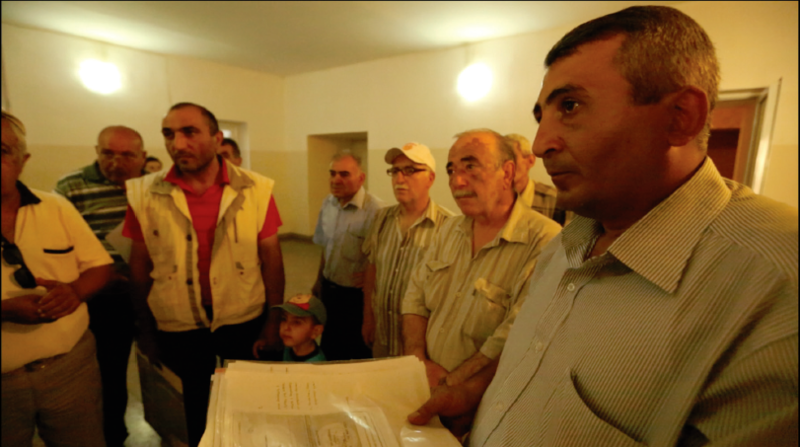 In one case, an entire family from Martakert fled Artsakh to avoid the consequences of refusal. Gen. Samvel Babayan, Karabakh’s Defense Minister and Commander-in-Chief (1994-2000), is the man responsible for these developments and credited with provoking a culture of machismo and corruption in the military. As a result, women’s efforts to break down barriers and achieve gender equality— during and after the war —were threatened. History often fails to recognize the contributions of women. Women who have exercised power, determined the course of events, and fought for our rights and our peoples are often forgotten. Women’s roles in the war should be honored and particularly respected due to all the hardships they faced as a result of their courage. Just like their male counterparts, they too had the next generation in mind when risking their lives for their homeland. We must now ask ourselves – what have we done and what will we do to carry on the legacy of women like Varduhi Gevorgyan, Gayane Arakelyan, Garineh Danielyan, or Anoush Ter-Taulian? Danielyan, G. (2008). Personal interview with T. Aghabekyan. Kasbarian, A. (2001). Challenging the Order or Reconfirming It? Reflections on Nationalism and Gender in the NagornoKarabakh Self-Determination Movement, 1988-1995. Doctoral Dissertation, Rutgers University, New Brunswick, New Jersey. Ter-Taulian, A. (2001, January). Personal interview with A. Kasbarian. The Armenian Youth Federation has proclaimed 2012 as the Year of the Armenian Freedom Fighter. The AYF Western Region Chairperson, David Arakelyan, explains the reasons behind that decision and shares his experiences of interactions with azadamardiks in Armenia. The history of our people is a tale of survival and victory against great odds and powerful enemies. From Vartanank to Sardarabad, the Armenian people have shown that our determination to live on the land of our ancestors cannot be shaken even by the mightiest of the foes. Over the course of the centuries, we have had to prove that determination to those who aimed to destroy our culture and our country. Most recently, an existential struggle was waged for the liberation of Artsakh, which was able to defend itself through the tremendous sacrifice of its people and the uncompromising stand of Armenians worldwide against the genocidal policy of the Azeri government. This year, we are marking the 20th anniversary of the Liberation of Shushi, perhaps the most important victory of the war, which ultimately enabled the independence of Artsakh and ensured the survival of its people. Shushi was the new Vartanank, the new Sardarabad for the generation of our parents and it stands as one of the most glorious pages of the Artsakh Liberation struggle. Every year in May, the celebratory parades in Yerevan and Stepanakert mark this important victory and send a clear message to our enemies that our military – the only guarantee of our existence – is capable of defending our country and our people. 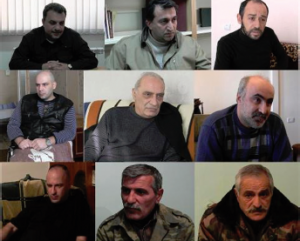 What remains in the backdrop of the military fanfare and the loud speeches of government officials are the stories of those who fought and bled for the liberation of Artsakh. With all the pride that the Armenian political establishment takes in the victory in this war, these same politicians have failed to take proper care of those who risked their lives and sacrificed their health to give us a free Artsakh. Obviously, this is not the only area where the efforts of our government have not been sufficient to address the existing problems. But from the many stories of neglect and betrayal by the state, the story of our freedom fighters is the most embarrassing and painful one. This state of affairs is especially dangerous given the ongoing ceasefire violations by Azerbaijan and the constant threat of renewed hostilities. The recent events on the border prove that we must have a strong military with high morale in order to ensure the security of Armenia and Artsakh. That, in turn, requires having a society where those who protect our country have the respect they deserve and receive the treatments they need for wartime wounds and injuries. Without that, our ability to respond to another possible aggression from Azerbaijan significantly weakens, exposing our country to new threats and new dangers. And we know all too well that a failure to properly defend our borders will have detrimental consequences for our people and our statehood. Under these circumstances, the Armenian youth has an important role to play in filling the void left by the government. We are the generation that enjoys an independent Armenia and a free Artsakh, which would not have been possible without the sacrifice of our freedom fighters. It is our turn to rise to the occasion and honor these heroes, tell their stories, learn from their deeds and help them in their time of need. We should not forget that these guys were not much older than we are (and many were even younger) when they left their homes and took up arms to protect our country. They have had to live with the consequences of that decision ever since, having been deprived of many things that the rest of us take for granted. Showing appreciation and support is the least we can do for those who have sacrificed so much for us. That is the main reason why the Armenian Youth Federation has proclaimed 2012 as the Year of the Armenian Freedom Fighter. During the course of the year, we have organized a number of events to educate the public about the problems faced by the azadamardiks and to raise funds to assist them in solving their health issues. What we have accomplished so far, though significant, is not sufficient to make the impact we want to make on the lives of freedom fighters in Armenia and Artsakh. This is an issue that should concern not just the AYF, but all Armenians, in the homeland and in the Diaspora alike, and I encourage everyone who is reading these words to join the effort and become a part of the solution to those problems. The fact that those problems exist and they are deep and serious became very obvious to me when I visited Armenia earlier this year. This short trip – the first one I took since leaving Armenia 20 years ago – left a lasting impact on me and reinforced the urgency and the importance of this campaign. The people I met – the individuals who helped our nation in the time of need – are now in need of help themselves, some confined to a wheelchair, others unable to see due to severe eye injuries and many others incapable of finding work because of various health impairments. As most of Armenia’s population, these men (and women) live in homes built during the Soviet era which have not seen any repairs since the country became independent. Many have no jobs and the ongoing economic problems are compounded by the physical pain from injuries and the unbearable red tape that makes getting medical help through government programs nearly impossible. I vividly remember the trip to Hrazdan (in the Kotayk province) to visit Armen Begyan, a young man in his late 30’s who was just 19 years old when he joined the newly formed Armenian Armed Forces and went to the front lines. Having fought in Karvajar and Mardakert, Armen was wounded and spent a long time in snow and cold prior to being rescued by his fellow soldiers. As a result, he lost mobility in both of his legs and is now confined to a wheelchair. I found him and the remaining three members of his family in the living room of his small apartment. 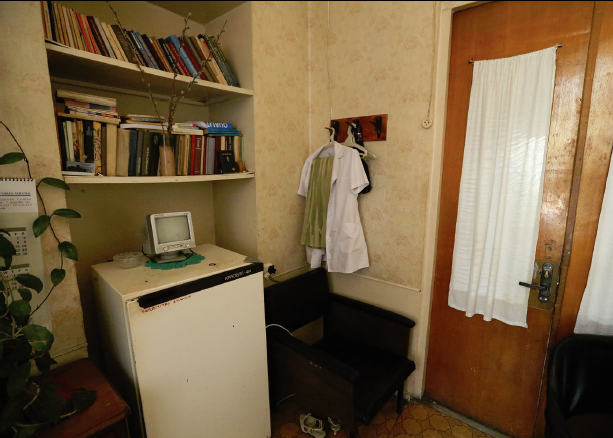 The family cannot afford to heat the entire home, so they eat, sleep and live in that one room. Armen needs expensive treatments and post-surgery rehabilitation, but obviously cannot afford any of that: his monthly pension is barely enough to cover the cost of food. Even in his situation, the proud soldier is not asking for charity. I was surprised to hear that he actually wants to get a special car, which he can use to work and take care of both his family and his medical needs. It is a shame that he has not been given this opportunity by his own country, but we have taken on his cause and want to help this azadamardik become an independent member of the society, something which is very challenging in Armenia for people with mobility issues and something that Armen wants more than anything else. In the city of Charentsavan, I met Hamlet Vartanian. He is known by everyone in the small town because of the deformation of the eye (a scary picture) that was caused by the war-time wounds. In 1993, he was actually treated for leg injury and got a blood infection as a result of the unscrupulous ‘care,’ which caused a damage in his nerve and resulted in the shift of the pupil of his eye. The condition is not only uncomfortable since Hamlet lives in constant pain and under the close scrutiny of the local kids, but also dangerous for his overall health. He has waited for 15 years to start living a normal life, to have a family and build a better future for him and his mother. That will not be possible unless we all show our support to this azadmardik. I had a particularly inspiring encounter with a man named Mikayel Apresian, who was a commander of the ‘Artsakh’ military unit during the war. 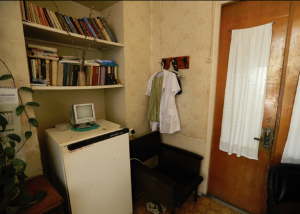 When I walked into his small one-bedroom apartment in the suburb of Yerevan, a gray-haired man in his 70’s (or so it seemed; in fact, he was only 57) slowly approached me, breathing heavily and with great difficulty. Mikayel had a distinguished military career, and in both his actions and his speech, one could see the once charismatic commander who led his men towards many victories. I spent a long time talking to him about the war, his comrades, and his life since he retired. Mikayel did not want to talk about his condition, which, as I found out, was already hopeless: he had been diagnosed with cancer. With a weak voice interrupted with severe coughs, he told me some of the most memorable stories I heard during my trip. Towards the end of our conversation, his friend asked for help in paying for MIkayel’s chemotherapy. Unfortunately, the cancer had spread too far and wide by then, and it was too late to stop its destructive work. Mikayel Apresian passed away shortly after my return to the US. Mikayel’s death is a testament to the urgency of the situation. Our freedom fighters have endured enough in the battlefield and they deserve a better treatment from all of us. Most of them, unwilling to discuss their medical needs, were more concerned (or as it seemed to me, disappointed) by the simple lack of attention from the authorities and the public at large. They neither complain about their conditions nor demand too much from people around them. More often than not, we use this modesty as an excuse to ignore their needs until one day it is too late to do anything. As an Armenian, I am ashamed that we have to deal with these problems a generation after the war, but I also know that if we do not do something about this issue today, tomorrow might be too late. The last thing I wanted to share about my trip is the deep feeling of respect and admiration that I developed towards these individuals during the course of my visit. At the end of our interviews, I asked each of them whether they would choose to do the same thing if they had a chance to go back in time. The answer that I invariably received was a unanimous and an unwavering ‘Yes.’ Despite the years of neglect, pain, suffering, and deprivation these people are still the soldiers that our nation can count on in the time of need. They are not just a part of the story of our glorious past; they can and will be the writers of the story of our future. It is up to all of us, me and you, to help them write that story. We owe it to them and to ourselves to give these people the chance to have normal lives as a way of expressing our deep gratitude for their service to our nation and the gift that they have given to our generation – the gift of a free and independent Artsakh. That gift must be cherished and preserved so that we can add new victories to the liberation of Artsakh and make our shared dream of a free, independent and united Armenia a reality in our lifetime. 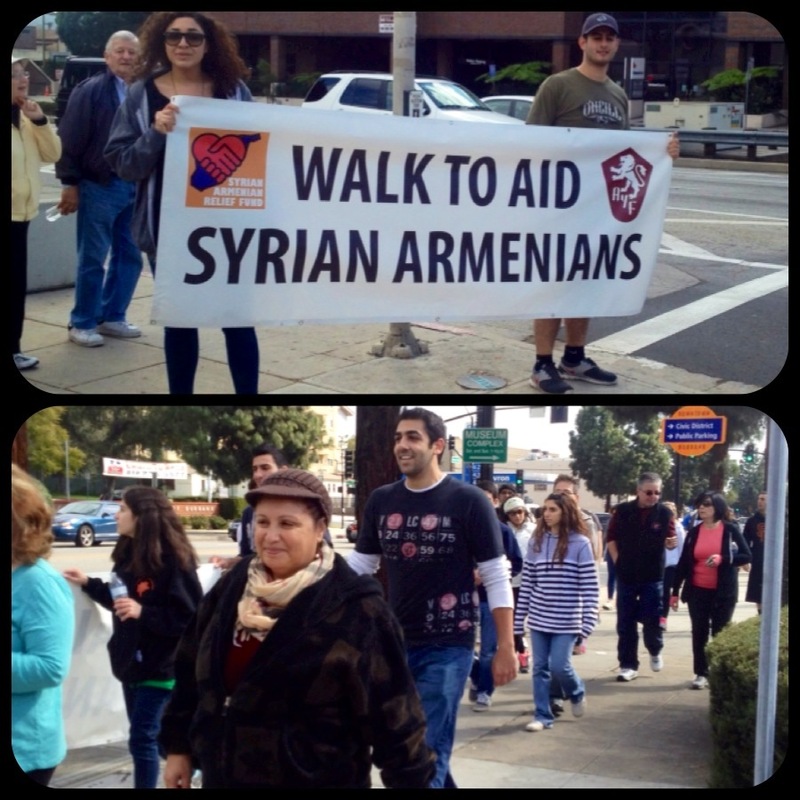 BURBANK, CA : On Saturday, February 10, 2013, the Armenian Youth Federation- Burbank “Varak” Chapter hosted a walkathon to aid the Armenians currently residing in Syria. 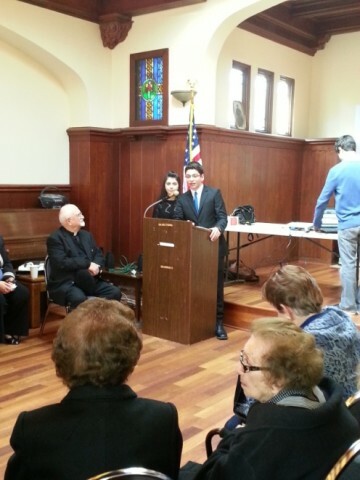 This event raised funds, as well as awareness within the community, for the Syrian Armenian Crisis. “Those currently residing in Syria live in a very dangerous environment as the civil war continues to ignite violence and destruction throughout the country,” said Armen Tashjian, one of the walkathon participants. Schools, churches, homes, and community centers have been torn down. Crimes of kidnapping, murder, and torture have been executed by rebel and militant forces. As a result, thousands of Armenians have been displaced, while others continue to struggle living in the midst of a cross-fire. Registration began at 10:00 a.m., where dozens of concerned community members signed up to participate in the walkathon. At approximately 10:45 am, the eager participants began their 3.5 mile walk toward the Burbank Youth Center. During the walk, volunteers passed out informational postcards to stores and pedestrians on the way. The participants reached their destination at 12:45 pm. Upon arrival, a member of the Syrian Armenian Relief Fund, Mher Tavidian, spoke about the organization, highlighting what it does and how it’s effective . “It was great to see AYF and non-AYF members alike unite under a common cause to show that we care about the well-being of brothers and sisters in Syria. As diasporan Armenians, it is our duty to offer helping hands to fellow Armenians who are in need of aid,” said Harry Pehlivanian, a member of the AYF-Burbank “Varak” Chapter. The Armenian Youth Federation Western Region is proud to announce that applications for the 2013 Youth Corps program are now available online! Youth Corps is a summer camp program, aimed at providing the most memorable, productive and exciting means for Armenian youth to establish and strengthen their ties with the homeland. Since its inception in 1994, Youth Corps has been empowering young Diasporans to take on a more direct role in the nation-building process in Armenia. In the summer of 2012 alone, the Youth Corps day-camps in Gyumri, Stepanakert, Askeran and Broshyan accommodated more than 850 children, with each session being filled at almost double the projected capacity. Bright and interested candidates are encouraged to apply as soon as possible so that we may continue this growth and reach out to even more children this year! The Youth Corps program is 6 weeks long, with 5 weeks of volunteer work and 1 week of touring. In addition to volunteering with kids and helping shape their futures, Youth Corps participants will travel throughout Armenia, Artsakh and Javakhk, experiencing historic, exciting, and off-the-beaten-path adventures! This combination of touring and volunteer work is perfect for both first-time visitors, and frequent travelers to Armenia. The program is now open to ALL motivated individuals between the ages of 18-30 who are enthusiastic about helping their homeland. To get a better sense of the program through photos, videos, and blogs from past years, visit www.ayfyouthcorps.org.